New Society Publishers, 9780865718678, 208pp. Intrinsic Hope offers a powerful antidote to these feelings. It shows how conventional ideas of hope are rooted in the belief that life will conform to our wishes and how this leads to disappointment, despair, and a dismal view of the future. As an alternative, it offers "intrinsic hope," a powerful, liberating, and positive approach to life based on having a deep trust in whatever happens. 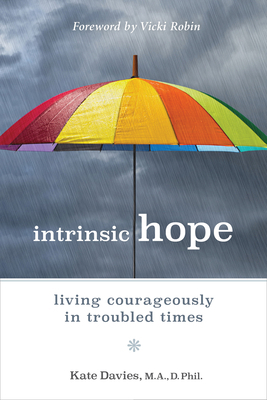 The author, a hopeful survivor, shows how to cultivate intrinsic hope through practical tips and six mindful habits for living a positive, courageous life in these troubled times. Kate Davies MA, DPhil, has worked on environmental and social issues for her entire career. She set up and managed the City of Toronto's Environmental Protection Office and established and directed a successful environmental policy consulting company. Davies is currently clinical associate professor in the School of Public Health at the University of Washington, emeritus faculty at Antioch University, and senior fellow at the Whidbey Institute. Her written work has been published in newspapers, magazines and journals across North America and internationally. Her first book, The Rise of the U.S. Environmental Health Movement, was selected by Booklist as one of the top ten books on sustainability published in 2013. Davies lives in Langley, WA.